Kelli Junker, DDS provides comprehensive dental services, from cleaning and oral examination to full-mouth restoration. Our experienced team of dentists and hygienists offer the highest quality general dentistry, cosmetic dentistry and pediatric dentistry. We present all options and allow you, with the doctor’s guidance, to choose the treatment that best suits your needs. We will equip you with the information necessary to be an informed decision maker, and we encourage you to ask questions and express concerns regarding your treatment. At Kelli Junker, DDS we place an emphasis on preventive care. Regular examinations include cleaning, prophylaxis, digital x-ray, periodontal probing and oral cancer screening. We practice “minimally invasive dentistry,” utilizing periodontal, restorative and endodontic procedures, when indicated, to preserve as much of your natural tooth structure as possible. We employ the latest state-of-the-art technologies in our dental practice such as an intra-oral camera, which is an exceptional diagnostic tool and enables our patients to view their teeth and gums on the screen. We want to be your trusted guide and partner in the management of your dental care. When it comes to your health and your smile, you should accept nothing less! If you have chipped, broken, uneven or missing teeth, you may need to undergo a partial or full-mouth restoration. We offer several advanced solutions for replacing or repairing teeth, from single crowns to a full-mouth reconstruction. The CEREC® system makes it possible to do one-visit crowns and veneers – no more temporaries, no more filling your mouth with gooey impression material; just shorter, faster visits when needing crowns and veneers. Unlike the traditional methods used for dental restorations, CEREC® requires fewer injections, less drilling, and less time out of your busy schedule. A CEREC® tooth restoration isn’t just convenient, it’s also healthy. Instead of the amalgam, gold- and silver-colored mercury fillings of the past, CEREC® uses stronger, natural-colored, ceramic materials. 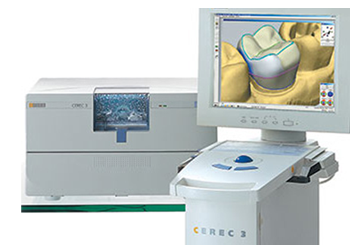 Contact us today to learn more about CEREC®. If your teeth are misaligned, you may be a good candidate for Invisalign, which is the clear alternative to metal braces. We offer a FREE Invisalign consultation prior to you making a decision to use Invisalign. When pulp tissue becomes infected, non-vital, or hypersensitive, endodontic treatment can save a tooth, eliminate pain and prevent infection. Treatment involves removing the pulp tissue, and cleaning, disinfecting, sealing and filling the canals. This is usually accomplished in one or two appointments. Antibiotics, if necessary, will be prescribed. Sedation (sleep) dentistry makes dental work easy and comfortable. Sedation is different from anesthetic injections. The technique is easy, safe and requires no needles. We will thoroughly review your medical history and closely monitor your vitals during your appointment. Best of all, the medications create such a comfortable experience that most patients do not remember the visit; it is as if they slept through the treatment. In reality, oral sedation dentistry maintains a level of consciousness in the patient for safety and cooperation. To learn more, visit SedationCare.com. Kelli Junker, DDS offers exceptional dental care for families with children of all ages. Our friendly staff and gentle approach to dentistry help children feel at ease with our procedures. We are committed to providing a comfortable environment and an enjoyable experience for all of our patients. Our staff teaches proper dental hygiene to all of our young patients to ensure good habits are established early in life. We also work with parents to make sure they understand how to properly brush their child’s teeth. We encourage parents to schedule their child’s first dental appointment by the age of three. From age three on, it is imperative that children see a dentist on a regular basis. If you or a loved one snore or have difficulty sleeping at night, we encourage you to call our office and have a sleep study done to rule out this potentially fatal condition. Or, if you have been diagnosed and are seeking alternative solutions for obstructive sleep apnea or sleep disturbed breathing issues, call us to explore a sleep apnea dental appliance today! We have different appliances for different needs. We spend approximately 1/3 of our lives asleep. The impact of sleep deprivation affects nearly all of the body’s systems. Further, sleep deprivation worsens almost every disease (ie: diabetes, cardiovascular disease, immune diseases). Dropping from 7 hours of sleep per night to 5 hours creates double the risk for cardiovascular death. Reports estimate approximately 20% of adults suffer from sleep apnea. Yet sleep disorders remain undiagnosed and unidentified 90-95% of the time. The spouse of someone with a sleep breathing disorder (snoring or apnea) looses an average of 90 minutes of sleep per night. Nearly 25% of partners report sleeping in different rooms because of snoring partners. Regrettably a recent survey showed that 76% of physicians who were not sleep specialists do not screen their patients for sleep breathing disorders and therefore do not refer their patients for testing or treatment. It is time for dentistry to step up to the plate. Lives can be significantly improved… and saved. A recent study by the American academy of periodontology showed that lack of sleep ranked just #2 under smoking as the lifestyle negatively affecting oral health. Research is ongoing but has so far shown that sleep breathing disorders are implicated in the creation or exacerbation of cardiovascular disease, cerebrovascular disorders, impotence, depression, poor memory, menstrual irregularities, weight gain and bruxism (teeth grinding).